The greatest love story ever told…with fingers. 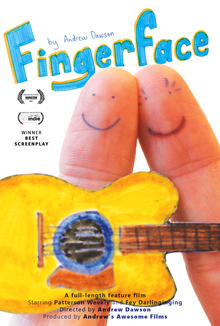 Fingerface is a feature-length romantic comedy, more comedy than romance, about an ordinary guy who falls in love with his dream girl and then meets her in real life. Small in budget but big on ambition, the film is set in exotic locations around the world and features some of the finest and most convincing pirates, estate agents, cult leaders, convicts and guitar pickers ever drawn together.